Discussion in 'Guitars in General' started by atquinn, Apr 14, 2019 at 10:18 AM. I'm a big Suhr fan, so there are a lot of Andersons I'm not interested in as they would be redundant with my Suhrs. 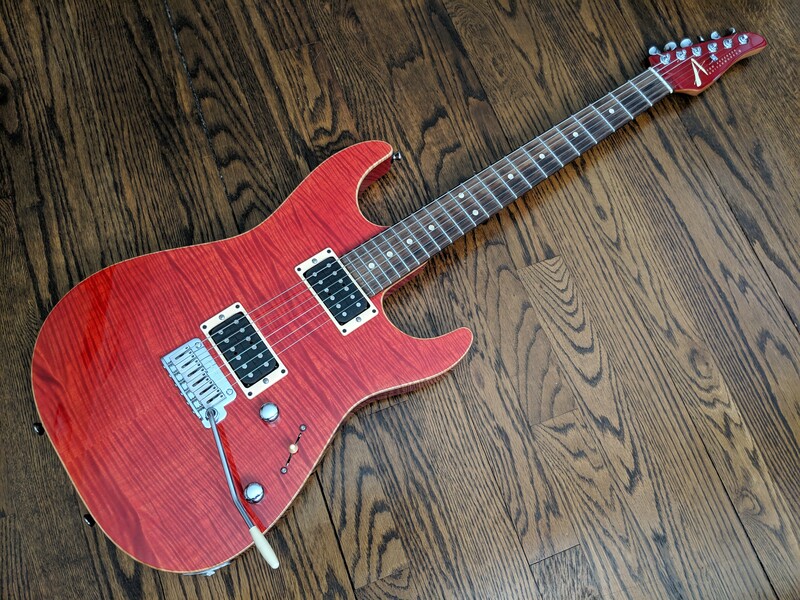 Suhr doesn't make shortscale bolt-ons though, so I've had my eye out for a Cobra S.
Finally the guitar didn't come with a plastic tip for the trem arm and the ones I have floating around in my parts drawer didn't fit. I sent Anderson customer service an email to find out the dimensions so I could buy one and Tom Anderson himself replied to me and sent one out for free. All said, very happy with my first Anderson! Spirithunter, StockRock, Paleolith54 and 13 others like this. Congrats! Big Anderson fan. Just look at my avatar. Welcome to the family. TA makes freakishly good guitars. I've been a fan of the Cobra for a long time. Congrats on owning that gorgeous one. I always remove the plastic tips from the arms. I found it amusing that you're in the opposite position. ...I always remove the plastic tips from the arms. I found it amusing that you're in the opposite position. I'm weird. I actually drill out Fender trem tips to put them on my Gotoh 510 trem arms . Don't like them on Floyd arms but traditional trem arms feel too short to me without them. Looks great! I have the same frets on my Angel and really like them. Nice guitar! I have a Hollow Cobra S as well with solid Rosewood neck and fingerboard. It didn't have the stock pickups when I got it. I installed Thornbuckers in it and am very happy with the tone. I played a Cobra T a few years back in Cajun Red at Eddies in STL. Came very close to walking out with it. I really like the color on your cobra ! My Hollow Cobra S (all rosewood neck) is my favourite guitar. I had it built with M1/M1/H2+ and so far those are the pickups that spent the most time in there (and are in there now). At one point I swapped out the H2+ for an HF1+ and I LOVED that pickup in there. However, it didn't balance well with the other pickups (vintage vs modern sounding), so put the H2+ back in. I've since tried the HW2, HC2, H3, H2, HO2 and a Duncan Alnico II Pro (I know, blasphemy). Of those, the HF1+ was my favourite - clearly I'm a low output guy. The H2 and H2+ were tied neck and neck, the H2+ is in there now, because I wanted a much hotter bridge to the neck for whatever reason, and it's a meat grinder of a pickup. Great for rhythm rock. The HF1+ is a classic old school PAF with sparkle. It does everything a great PAF does and then some. It brought instant vintage Les Paul to the guitar, and easily cut through the mix for leads. The H2+ on the other hand is a hot modern sound 'bucker. It cleans up well, but doesn't have that 'alnico' chime or boosted upper mid thing that the HF has. But, what it lacks in 'vintage mids', it makes up for in girth and power. I've worked out that it needs to be EQed very differently at the amp for cutting leads, and now I know longer fear being 'lost in the mix'. I can definitely see why some people are gun shy on the H series pickups and prefer to replace them with HF or other brands. They do sound different to regular middy humbuckers, and need to be treated as such. 1bluzman, StockRock and atquinn like this.